Welcome to our Summer Day Program! This program was carefully designed to provide children with an active day of learning, fun and games! Our swim lessons focus on teaching the basics of breath control, buoyancy, balance movement and safety. 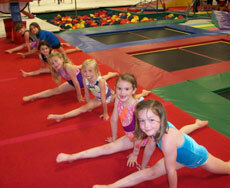 Our gym lessons focus on teaching strength, flexibility, coordination and creative movements. 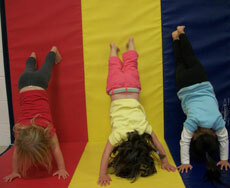 A variety of games, activities and challenges will keep the children active, engaged and excited throughout the day. Our superb staff is energetic, caring and committed to creating a wonderful experience for every child. In addition, our swim staff are American Red Cross Lifeguard certified and all gym activity will be supervised by USA Gymnastics Safety certified staff. 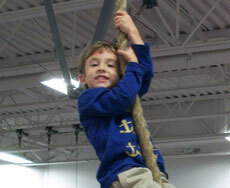 MONKEYS: Spend the day exclusively flipping and swinging around the gym. Each full day includes: a structured gymnastics lessons, open gym exploration, a STEM inspired activity, special interest learning with Planet Ninja and Planet Yoga, a craft project and gym games. Child must be at least 3 years old and potty trained for the Monkeys group. PENGUINS: Spend the day both at the gym and in the pool at Little Flippers Swim School. Each full day includes: a structured gymnastics lesson, a swim lesson, guided pool discovery, a STEM inspired activity, a craft project as well as pool and gym games. Child must be at least 4 years old and potty trained for the Penguins group. 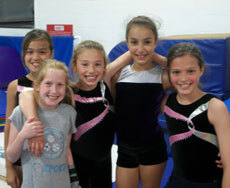 Program registration is easy and ongoing. Advanced registration is highly recommended but last minute enrollment may be accommodated. Convenient curbside drop off is now available. Package pricing is available for greater savings. Packages can be used on any child in your family. Days booked do not need to be consecutive. All visits do not need to be scheduled at the time of package purchase. Participants must bring a lunch. A nut-free, healthy morning snack will be provided for participants and an additional snack will be provided in the afternoon. Outside snacks are not permitted unless prior approval attained from the program directors (call to inquire). We will offer separate seating at lunchtime for children with allergies. Swim Suit – We recommend one-piece bathing suits for girls and swim trunks or Speedos for boys. Rash guards are okay. No t-shirts, shorts, or sewn-in floats allowed. No swim aids (inflatables, etc.) of any kind are allowed, as they can be a drowning risk. Towels are not provided, please pack accordingly. Goggles are recommended but not required. They are helpful in getting a child to submerge and gain comfort while doing so. We offer a variety of goggles at our pro shop. Please note that instructors will lead some skills without the use of goggles. Swim Caps and / or Hair Elastics. All children with long hair (touches the shoulders) must have their hair pulled back. Swim caps may be purchased at our pro shop. An extra set of dry clothing. 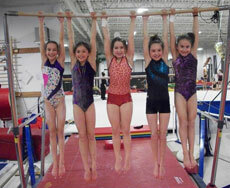 Girls: Please bring either a leotard or shorts and a T-shirt for the gym. Boys: Please bring shorts and a T-shirt for the gym. PLEASE NO: glass containers of any kind, jeans, belt loops, baggy clothes, jewelry, or footed tights. Please make sure that all long hair is tied back. 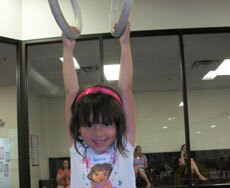 All children will be asked to take off their shoes and socks while at the gym.